Pequea Hinge, previously a B2B company selling wrought iron hinges, latches, and pulls to contractors and retailers, has branched out to sell their hardware to individual customers. For the first time since opening in 1999, anyone can now buy their products. For the first time since opening in 1999, anyone can now buy custom iron-forged products from Pequea Hinge. The company makes hand-forged hinges for household doors, kitchen cabinetry, 18th-century restoration hardware, timber frame barn & stall doors, and more. Their high-quality craftsmanship, expertise, attention to detail, and integrity set them apart from the rest. The vision for Pequea Hinge started when Amos Fisher, then a full-time timber framer, struggled to find adequate hardware for his projects. Caring both about his reputation and the quality of work he was producing, he set out to create the products he had so desperately been looking for but couldn’t find. Realizing he found the solution to his problem and a niche need, he decided to expand his venture by opening a small business on his family farm. In 1999, Amos opened Pequea Hinge. His son, Ivan, joined the business in 2001. 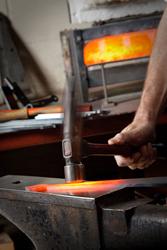 With their interest in high-quality hardware and the art of blacksmithing, the two men studied with an accomplished blacksmith to learn the trade. If you’re looking for unique DIY decorative projects or affordable ways to makeover your kitchen, start with Pequea Hinge. Shop their website store at http://www.pequeahinge.com or Etsy store at etsy.com/shop/pequeahinge. Invoq is a full service marketing agency specializing in Inbound Marketing and Growth Driven Design – a dynamic duo that solves the greatest amount of problems, produces the best ROI, and generates the strongest potential for further growth.​ Visit us at invoqmarketing.com.